It is amazing the changes out bodies go through when we exercise. But how much our mind set changes is pretty amazing too. As a stay at home mom most of my energy in each day goes towards my son or household. Finding activities for him to do to keep him happy. Chase him around the house. Teach him a new song, or read a book to him. Keeping the house clean. Making food for everyone. And it goes on and on. Too many times moms focus on everyone else and not themselves. I used to watch that show, What Not To Wear, and more often than not it was a mom who took care of everyone else. Finally they were taking care of themselves and felt so happy and vowed to continue when they got home. Not sure if they made the full change, but decide today that you are going to make changes. It is ok if the house is messy. My goal is to keep the main floor clean incase unexpected guests arrive or for when I teach. 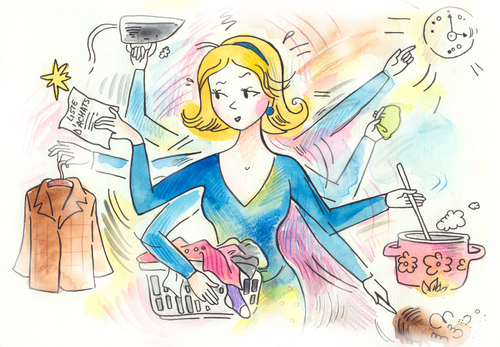 I usually do a big cleaning day, or a laundry day, but never on the same day. Too much with everything else I have to do. Decide to take just a little time for you today. Have quiet time. Read a book, pop in your fav workout DVD. Go to the GYM. Follow a new workout on Hulu (there are tons!). Stretch. Do something and you WILL NOT REGRET IT!